What To Do For Healthy Spine? Due to the high mobility in this area the spinal stress fracture often fails to heal. However these fractures generally cause pain in adolescence, and they may not create serious problems in adulthood. In some patients the fracture causes the upper vertebrae to slide to the front in relation to the vertebra below. This condition is called “lower back slippage” or “spondylolisthesis”. Spondylolisthesis may create more serious problems depending on the amount of slippage. “Lower back slippage” caused by this type of fracture is called “isthmic spondylolisthesis” in the medical literature, and is most commonly seen as slippage of the L5 vertebra over the S1 vertebra. It was observed that 5 to 10% of patients presenting to the doctor with low back pain had lumbar slippage. Another type of lower back slippage is the “lower back slippage” that is seen in people older than 40 years and caused by age dependent wear of the connective tissues surrounding the spine. This problem is named “degenerative spondylolisthesis” in the medical literature. Lumbar slippage caused by aging and wear is generally forward slippage of the L4 vertebra over the L5 vertebra. Lower back slippage is often accompanied by “narrow canal”. What are the symptoms of spinal stress fracture? Spinal stress fractures (spondylolysis) may not always produce symptoms. They may be seen incidentally on lower back X rays taken for other reasons. If there are clinical signs, these may be seen as lower back pain, buttock pain, tightness in lower back muscles, and rarely numbness, pain (sciatic pain), and weakness in the feet. The pain often increases while standing, walking, or other activities, and decreases with rest. How is the diagnosis made in a spinal stress fracture? After listening to your complaints and performing your physical examination, your doctor may request your X rays if he or she suspects a spinal stress fracture or lower back slippage due to spinal stress fractures. However, spinal stress fracture (spondylolysis) may not appear on direct radiographs. In that case, if your doctor still suspects a fracture, then a scintigraphy and/or CT may be requested. If these studies have confirmed the presence of a fracture, then MRI may be deemed necessary for planning the treatment. MRI may be also necessary in patients who have slippage, leg pain and/or numbness to evaluate the spinal cord and nerves. If you have isthmic spondylolisthesis, then its severity will be graded from first degree to the fourth based on the amount of slippage. 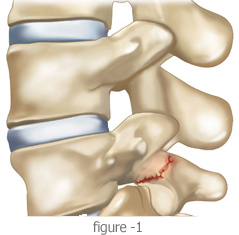 The diagnosis of degenerative spondylolisthesis is performed by direct X rays and MRI studies. Generally scintigraphy and CT may not be necessary in this type of lower back slippage. What are the treatment methods in spinal stress fractures? If your complaints are only lower back pain and the amount of slippage is not serious, and your doctor did not think that there is a severe nerve compression and affection, then the initial treatment of choice are nonsurgical treatment methods. These methods can be one or more of the following: rest, analgesic and antiinflammatory drugs, a temporary brace and physical therapy. If your pain continues, another method that can be used is the injection of steroids and regional pain killers onto the fracture site and the joints connecting the vertebrae (facet joints). If there is leg pain and numbness due to lumbar pain and nerve compression, then epidural or foraminal injections may be added. Pain due to stress fractures (spondylolysis) often heals with these treatments. However not all fractures completely unite. Failure of the fracture to heal does not pose a problem when occurs after the pain has dininished. Generally a severe slippage is not expected in late years. Still, these patients may require follow up by regular radiographic studies. When surgery may be necessary in spinal stress fractures? Surgical treatment may be necessary in patients whose symptoms persist after nonsurgical treatments. Also, if there is spinal cord compression due to the slippage, and this causes serious neurologic deficits (drop foot, urinary incontinence), early surgical intervention may be necessary. There are two types of surgical treatment in spondylolisthesis. The first is the repair of the fractured area. The repair procedure is performed if a wear has not yet developed in the disc between the L5 and S1. In isthmic spondylolisthesis and degenerative spondylolisthesis, the preferred surgical method is spinal fusion. If there is concurrent spinal cord compression, the areas causing the compression are removed during the same operation. The operative procedure can be performed from the front, back, or both. Fixation materials may be used. Healing is achieved with a good postoperative rehabilitation program.